Come learn why well over a million people from our western culture have taken part in this ancient firewalking ritual and why they would recommend firewalking to anybody. Firewalking is a chance to peak your curiosity about a life changing experience that people of all ages and from every culture from the beginning of time have participated in. If you are at all ready for a dramatic change with any part of your life or yourself, be sure to consider attending our next and only live Firewalk this year. DISCLAIMER: Firewalking is potentially very dangerous. Any information given within these firewalking pages is solely for informational purposes. 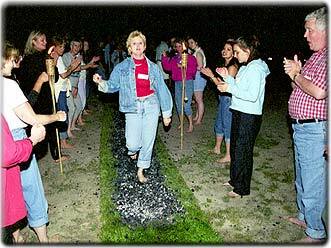 Under no circumstances are you being encouraged to firewalk without the supervision of a trained firewalking professional. Should you do so, you are accepting full responsibility for your consequences and actions.